Our Landscape Designer is committed to creating personalized gardens and outdoor spaces. This affordable Landscape Design service provides creative, individualized solutions to your landscape challenges, suited to your climate, soil and site conditions. Today’s investment in a planned landscape provides enjoyment for many years. Bordine’s no longer offers complete landscape installation or plant removal. We do, however, continue to offer Tree Plantings and Delivery Services (contact our Tree & Shrub department for details). 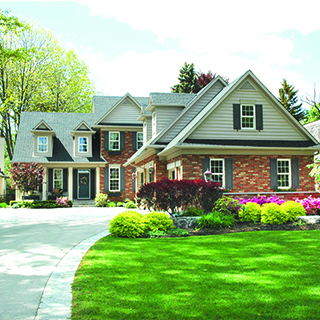 In our professional design plan, we will design a front/side or back/side of your home. Bring in photos and measurements and we will discuss your information and ideas. It usually takes a few days to a week to complete the plan and get it returned to you. All consultations are scheduled and completed by appointment only. Do you need a little guidance with your landscape? Bring in two to three color pictures of your home and our designer will create a design for you. This design session is limited to 30 minutes and we can only design a small area in this time frame. All 30-Minute Design Sessions are by appointment only. Bordine’s no longer offers site visitations. All design work is done at our Clarkston or Rochester Hills locations. Which side of your house faces north…noting how the sun rises and sets around your home for sunlight conditions. Bring in a “Wish List” of plants that you like as well as a list of colors that appeal to you. Our designer Karen Meissnest graduated from Purdue University in West Lafayette, Indiana in 1981. She graduated with a bachelor of science in landscape architecture, after graduating she’s worked for a wide variety of landscape companies as well as greenhouses in both Indiana and Michigan. Karen came to Bordine’s in 1997 working in perennial and tree and shrub sales and for the last 15 years has been our landscape designer.